Updates on construction progress. Reports on crew selection and training. Talking with sub veterans about changes in technology since they fought beneath the seas for our country. Visiting with Treasure State patriots about the need for new, high-tech nuclear-powered fast attack submarines like the future USS MONTANA. Accepting the first flag that will fly on Montana’s namesake warship. Greeting by a cheering UM Grizzly home football game crowd to shouts of “Go Navy!”. CDR Michael Delaney, commander of the future USS MONTANA and crew member Petty Officer Evan Glenn of Bozeman. All this was part of the exciting September 20-23 tour of Montana by the first commander of the future USS MONTANA, Commander Michael Delaney, and crew member Petty Officer Evan Glenn of Bozeman. The pair made stops in Billings, Helena, Great Falls, and Missoula – with enthusiastic supporters all along the way. In Billings, four area Rotary clubs sponsored a large public gathering of Montanans eager to learn more about the MONTANA that is expected be commissioned into the Navy fleet in late 2020. 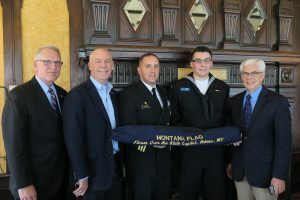 Montana flag for USS MONTANA from the State of Montana is presented to CO Delaney in Helena. Helena event attendees saw CDR Delaney accept what will be the first flag to fly aboard MONTANA at sea and in foreign ports. Ordered flown over the Montana Capitol by Secretary of State Corey Stapleton, himself a Navy veteran, the flag was presented by Lieutenant Governor Mike Cooney, Congressman Greg Gianforte, and Attorney General Tim Fox. Covered for the statewide Montana Television Network by KTVQ in Billings and KXLH-TV in Helena, a combined report may be seen here. CDR Delaney autographs vet’s Holland Club hat in Great Falls. 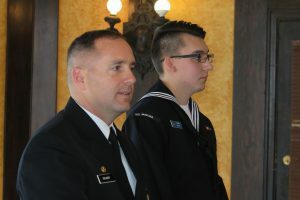 The Montana Base of the United States Submarine Veterans, Inc., hosted CDR Delaney and PO Glenn at a special dinner in Great Falls as part of the organization’s semi-annual statewide meeting. 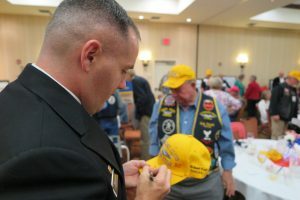 The veterans — a number wearing their yellow Holland Club hats signifying having received their submariner dolphin pins 50 or more years ago — and guests from as far away as England heard about MONTANA and her future role in defending our nation and our allies. CDR Delaney and PO Glenn cheered at UM football game. 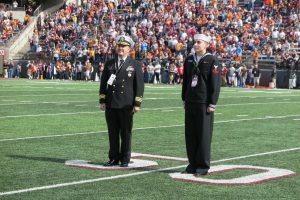 In Missoula, University of Montana Grizzly football fans enthusiastically welcomed to the playing field the two representatives of the warship that will bear Montana’s name. CDR Delaney and PO Glenn were able to see the ship’s bell from the original – and only other – USS MONTANA. 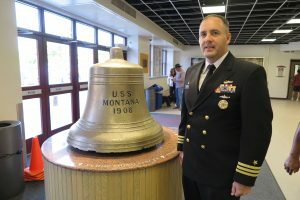 It is on display at the UM Adams Center and is likely to be the model for a submarine-sized replica bell aboard the new MONTANA. 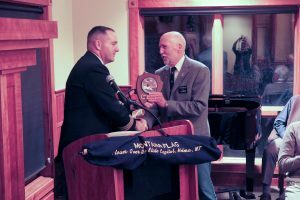 Western Montana Military Officers Association president Mike Schauf receives one of the first emblem plaques from the CO and crew of the future USS MONTANA. A special dinner in Missoula, sponsored by the Western Montana Military Officers Association, was attended by many submarine and other veterans, and many western Montana patriots eager to learn more about the new submarine and its crew. Questions at this and all the other events covered a wide range of topics, from what weapons the MONTANA would carry to what typical submerged operations might be like for the crew. At each event over the three-day tour, it was very clear that Montanans liked word from the CO that their namesake warship may be based in Hawaii! 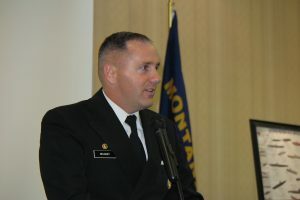 At every stop in Big Sky Country, CDR Delaney praised the support the crew is hearing and feeling from Montana and her residents as remarkable and unique. “USS Montana Committee” and its logo are trademarks of USS Montana Committee, Inc. Use or distribution of these marks is prohibited by law without express consent of the company.